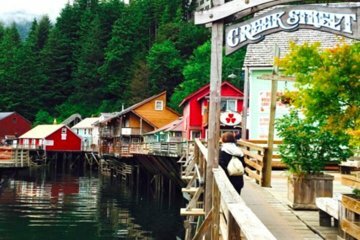 Gain a deeper understanding of Ketchikan and its indigenous Tlingit peoples on a tour of Potlatch Totem Park. Your guide, who navigates for you, provides a rarely–heard history of the area and information about the art form of carving and restoring totem poles. After free time to explore, enjoy a light snack at the Totem Trading Company as well as take a tour of the historic downtown.